Have you run out of gift ideas? Why not give the gift that comes with a lift? Deciding on the best gift for your friends, relatives and loved ones can be a testing time, but now you have the option of giving them a gift that is designed to enhance their beauty. My Cosmetic Clinic offers you the ease of selecting from a range of gift cards for Christmas, Birthdays and Anniversaries. There is nothing quite like receiving a personalised gift, chosen with love and care, for making you feel understood and appreciated. Select from multiples of $50, $100, $150, $200, $250, $300, $400 and $500 gift cards, and give that special person in your life the opportunity to indulge themselves in a variety of skin rejuvenating and cosmetic procedures with Dr Ansari. Our gift cards are perfect for anyone who has always wanted to explore the options of cosmetic surgery, but have been too hesitant to make the call. Give your loved ones the gift of a lift and bring the sunshine back into their lives this year. 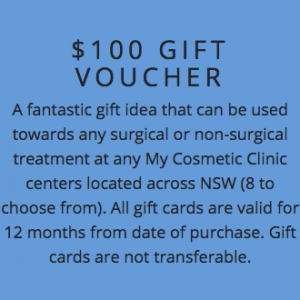 A fantastic gift idea that can be used towards any surgical or non-surgical treatment at any My Cosmetic Clinic centers located across NSW (8 to choose from). All gift cards are valid for 3 years from date of purchase. Gift cards are not transferable.